By combining the ST Sport Springs & ST Sport Shocks you get the best of all worlds and take the guess work out of suspension tuning, getting it done right the first time. ST Sport Springs are specifically engineered for optimal performance and comfort. Improve your ride with ST Suspension Sport Springs to lower the center of gravity, reduce body roll in corners, and limit weight transfer under acceleration. ST Sport Suspension kits are professionally designed & matched to meet the demands of the enthusiast & offer significant improvements in handling and grip. 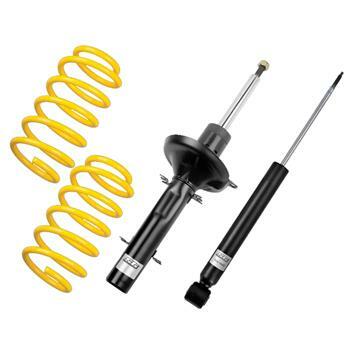 For a complete height adjustable suspension solution, check out the ST Speedtech Coilovers.